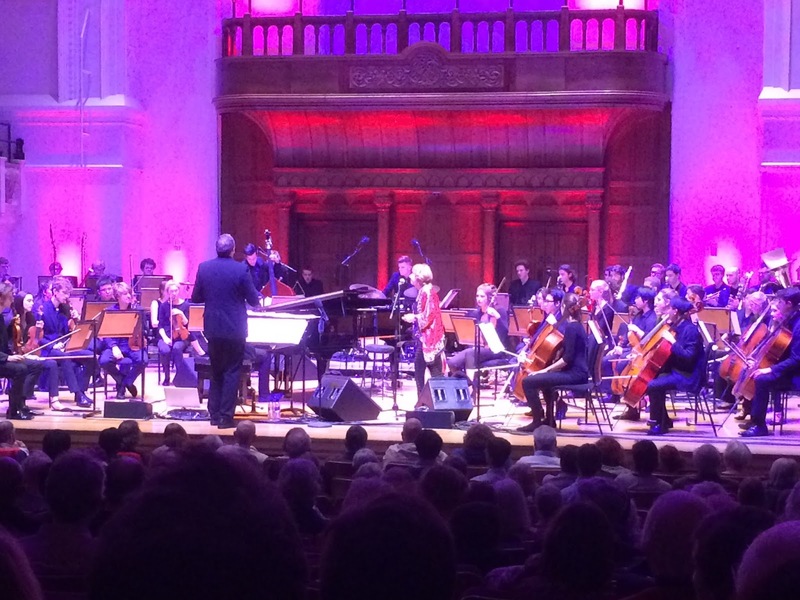 As I arrived at the Cadogan Hall’s desk to collect my ticket for the Gala concert for one of our most treasured of jazz national treasures, the volunteer sorting out the guest tickets turned to someone next to him: “Manfred Eicher’s not coming now.” I had to check I’d heard right. A couple of hours later I could only reflect, ‘Manfred, what were you thinking?’ This was not one to miss. First there was a set with Norma Winstone’s European Trio (recorded on ECM), pianist Glauco Venier and Klaus Gesing on reeds the other two elements of an exquisitely woven tapestry of sound. Their crystalline sound filled the hall and conjured moods from different times and places. The jazz diva started the set with a Madonna song Live To Tell Music, took in Tom Waits’ San Diego Serenade, a reading commented on and punctuated by an irrepressible performance from Gesing on bass clarinet. There was a moment freighted with emotion as Winstone’s sons, Alex and Leo Taylor joined the trio to perform a song, Deer on the Moon from the album they recorded with their father John Taylor shortly before his sudden death. On High Places, wordless incantatory vocals jousting with spiralling soprano sax conjured up North African vistas. An electrifying moment. The balance, blend and interplay of the trio was magical and as they closed the set with Venier’s driving piano leading them through a folky, dancing theme, that would have been enough; a masterclass in making the extraordinary look effortless. But there was more to come. The Royal Academy of Music’s full orchestra and Big Band, under Nick Smart’s direction breathed exuberant life into arrangements and compositions by a roll-call of Winstone’s collaborators across a fifty-year period, including half a dozen from the pen of her good friend and frequent colleague, the much-missed Steve Gray (1944-2008) and a specially written piece by Vince Mendoza. It was Norma’s night but Gray’s arrangements were another star of the show. Standards (Wait Till you See Her, Old Devil Moon) modern classics from Steve Swallow, Ralph Towner and Kenny Wheeler; all received the Gray treatment, written around that effortlessly agile voice. Familiar compositions took on a fresh and often surprising shine as the colours in the music were burnished and made to stand out and balance in new ways. Nikki Iles guested on piano for Ralph Towner’s The Glide, the arrangement including a John Taylor solo scripted and decorated by sections of the huge ensemble, another glowing moment. The finale, Life in the Modern World was a swirl of strings unfurling Gray’s arrangement, the swell of layered harmony enfolding and sweeping us along with the joyous spark of Norma Winstone’s voice at the heart of the sound. It brought everyone to their feet. The suite of Gray arrangements were another ‘worth it just for this‘ aspect of the evening. But there was more; the premier of that Mendoza piece, all exquisitely balanced tensions and lyrical soloing from Venier and Gesing; an eye watering and dramatic arrangement of Clifford Brown's Joy Spring. A Gala? More of banquet and spectacular celebration of a world class musician.